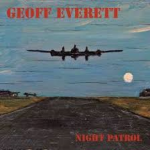 Share the post "Album review: GEOFF EVERETT – Night Patrol"
A couple of years ago, GRTR! reviewed a very tasty trio of albums by The Geoff Everett Band – “Adult Show” (2011), “The Quick and the Dead” (2014) and “Cut and Run” (2015). Geoff is one of Britain’s finest and longest-standing purveyors of country/rock/blues originals and interpretations and it’s great to hear him back in fearsome flow with his newly-released album, “Night Patrol”. It’s truly a testament to Everett’s standing in the wider blues community that “Night Patrol” features legendary harp-blower, Alan Glen (The Yardbirds, 9 Below Zero, BB King, John Mayall, Peter Green, etc.) and sax-player extraordinaire, Gary Barnacle (Tina Turner, Level 42, Elvis Costello and Jamiroquai – the list goes on !). Add those to his impressive career collaboration list of Lord Sutch, Alan Lancaster, Jim Russell (Stretch/Scotty Moore), Carl Palmer (ELP), Gerry McAvoy and Brendan O’Neill (Rory Gallagher/Nine Below Zero) and Ian Paice amongst many others and it’s clear that if Everett ever did start dropping names, there’d be some very deep holes in the ground outside his recording studio in Kent. Street, perhaps on a Fender ad which simply says “how your Strat should be played”. I’d be happy listening to him tune up. “Night Patrol” blends a straightforward and very satisfying driving country rock vibe (on tracks like “Where Did She Get The Money” and “Much Worse Than I Thought”) with sultry blues on “Walking With Dead Men”, which delivers a glorious “brass- kicking”….just wicked guitar/sax interplay on this one. “Fallen Star” sees Everett working out his pop sensibilities on a lovely tune which Ray Davies would have strangled his brother for. And that’s the thing I find with Everett’s work – there is a palpable Britishness to the way he adheres to the well-established tenets of country/pop/blues rock but still manages to take it all to the next level, weaving faithful interpretations which don’t drift far from the essentials but still sound fresh and vibrant. Check out the song “The Writing’s On The Wall” which encapsulates everything that’s good about this album – superb piece of music all round. There is plenty of deliciously swampy slide and jangling, twangy, razor sharp guitar work throughout the album – on “Woman That I’ve Never Met”, Everett somehow manages to channel Knopfler and Petty in the same room to great effect whilst “Stitched Up Again” is not so much “a tip of the hat”, but more the “actual brim of Keef’s fedora” in its Stonesy feel. Anyone know if Muscle Shoals is twinned with Kent? It should be – with Everett installed as Mayor. This entry was posted in ALBUM REVIEWS, ALBUM REVIEWS (Mobile), All Posts and tagged album, blues, Geoff Everett, guitarist, John Peel, Night Patrol, review, rock, THE WHO. Bookmark the permalink.